In BE IIIrd year, Civil engineering students study the design and treatment aspects of water supply and sanitary engineering. According to the course requirements, the students were taken to following tours that helped them to learn and explore. Tour for water supply engineering : On 3rd August 2016, BE III/II students were taken to Siddipur Drinking Water Project, Lalitpur around 3.5km from KEC. This project serves 3 wards nearby taking 9 lps from Godawari river. Students were familiarized with tubular sedimentation tank, slow sand filter, chlorination tank and elevated reservoir in the site. 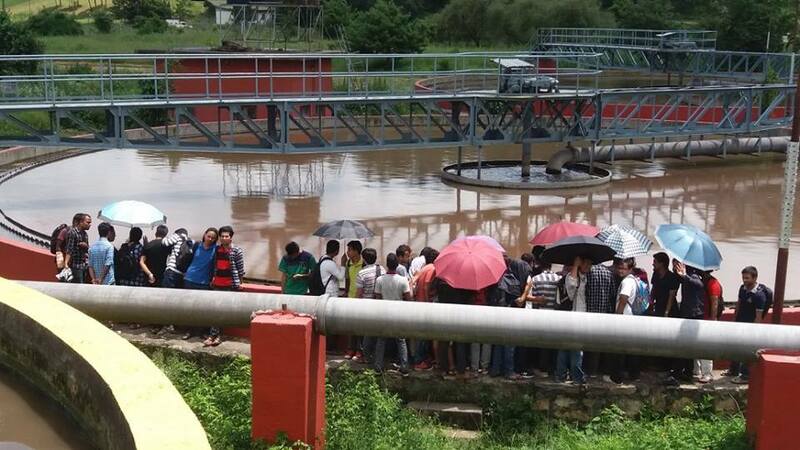 Tour for Sanitary Engineering : Next day, the students were taken to Guheshowri Treatment Plant, Guheshowri. This Project operates directly under supervision of government. Treating around 190 lps sewage collected from various places within Kathmandu valley, this plant discharges the treated sewage to river and disposes the sludge as compost. The plant consisted of Collection Chamber, Grit Chamber, Aerators, Digestion ponds and drying beds.